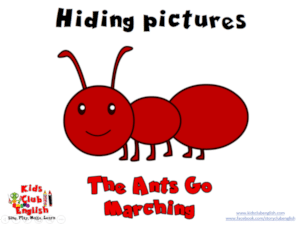 The Ants Go Marching is an attractive picture book based on the popular counting song. This version of the book is great fun for the kids. They love finding the ‘little one’ and counting all the ants on the pages. This song book is perfect for practising numbers, actions and even clothes vocabulary. Great for developing multiplication skills too. You can use this simple powerpoint game to provide a change of focus while still practising your target language. Activity suggestions are in the notes section on different games you could play with the images. Practise the actions from this popular song with these fun games.